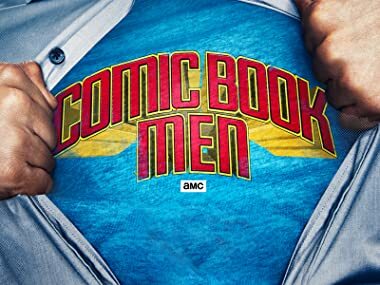 Comic Book Men returns with Kevin Smith, Walt, Bryan, Mike, and Ming banter behind the counter of the Red Bank, NJ comic store and geek-out over the rare pop culture memorabilia that comes through their doors. Kevin Smith sends his daughter Harley to the Stash to learn how to be a clerk. A customer sells his rare and unusual Rocky action figures. A returning customer swings by the store with a toy Walt always wanted but never had. An aspiring student brings in a book signed by comic greats. Walt challenges the guys to perform stand up comedy at the Stash. A collector brings in key Marvel comics from the 1960s. The guys agree to help out a friend and babysit her daughter for the afternoon. An Indiana Jones superfan tries to sell rare items from the films. Walt and the guys visit BronyCon, a fan convention for My Little Pony. A customer wants to sell a board game from the 1970s featuring Godzilla. Walt considers buying hand and foot prints of Adam West and Burt Ward from the Batman TV show. A customer sells a rare set of Star Wars comic strips. Kevin Eastman, co-creator of the Teenage Mutant Ninja Turtles, brings in his earliest sketches of the turtles to the Stash. Walt has a business proposition for original Ghostbuster Ernie Hudson. A customer comes in to sell cartoon shampoo bottles from the '60s. Adam West visits and a drag race between the Batmobile and the Black Beauty ignites. A customer sells the 1st comic appearance of Rocket Raccoon. Comic legends, artist Neal Adams and writer Denny O'Neil, drop by the Stash. The guys look at a pristine set of 50-year-old Batman night lights. Butch Patrick, TV's Eddie Munster, drops by the Stash. A Star Wars action figure so rare it was never officially released lands on the counter. Kevin's assistant Ashley brings her feminine wiles to the Stash and learns about comic book retail. A pair of pro wrestlers wants to sell their comic. 13. Comic Book Men 413: Sucka M.C. Hip hop legend Darryl McDaniels of Run DMC brings his new comic in to the Stash. The guys look at a classic Marvel Silver Age #1 issue. Star Wars legend Billy Dee Williams drops by the Stash to win the Millennium Falcon the same way Lando lost it - in a high stakes card game. Jason Mewes drops by the Stash to hang out and play clerk. Walt looks to acquire a mysterious recreation of some iconic comic book art. The boys rock out at a KISS concert and Walt lives out his childhood dream of meeting Gene Simmons. Ming considers buying an arcade cabinet.